It will ask you to sign into your Microsoft account again. Once you sign into, you would think the issue is over ,but thats where the bug starts… No matter how many times you sign into your Microsoft account again..and again..and again the notification will keep appearing , and very well do justice to its title, it will keep bugging you. Upon searching many forums and various personal trail and error methods, the solution was apparent to all of us. The users who had recently updated/changed their Windows Accounts password were affected by this bug. Many thought that the error was at server end, or due to some other unresolvable issue. This bug is triggered when you change the password of your Microsoft account. Windows 10 somehow fails to update the password over the existing one , and thus the bug exists. To solve this bug you would need to delete Your Microsoft Account password that is saved by Windows 10 and then simply sign in again with your updated password. Many of you might think that clearing passwords from the store and Edge browser might work, but Windows has upped its game. Passwords, on Windows 10, are stored in a nifty little utility called Credential Manager. 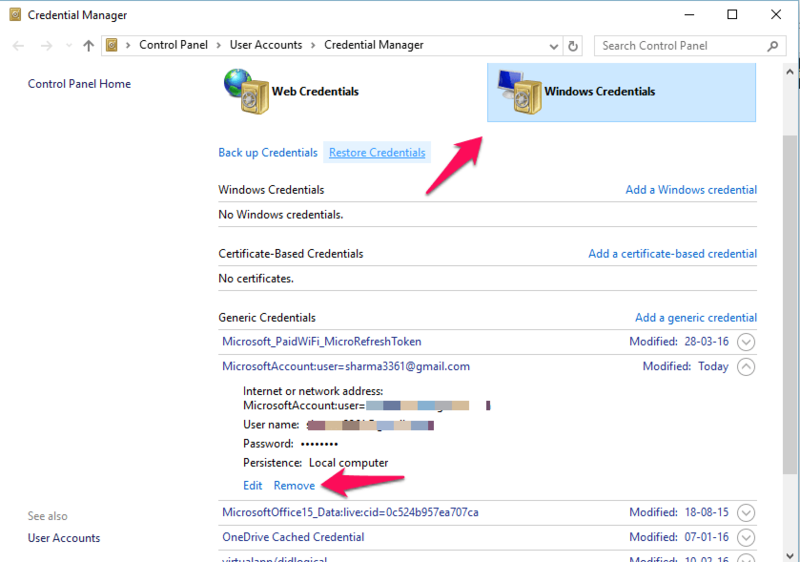 So to delete your Microsoft Account password, you need to access the Credential manager. Credential manager stores all your personal credentials and various other log in ids and passwords you have used on various other apps and places. 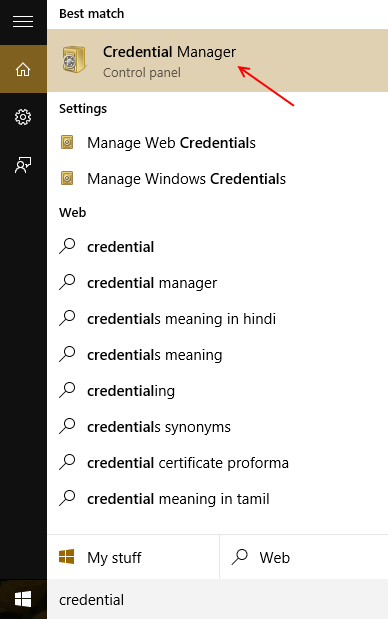 Accessing the Credentials Manager via the Search Bar. 1- Click on the Search bar and search for Credential Manager. 2- Select Credential Manager from the results to open it. The Credential Manager will now open. 2- Now select the Microsoft Account you have used to sign into Windows 10. 3- Click on Remove , placed at the bottom of your saved credentials. Tip: You can also click on Edit, beside Remove, below your credentials , and then update your Password in order to remove the bug . I get this notification on two computers and have never updated or changed my Window accounts password. I have yet to try this ‘fix’, but in other forums some have said the problem re-occurs, one saying that it happens after a security updates. At any rate, I’m tired of reading that the notification occurs after users change their Windows account password when it is not correct.